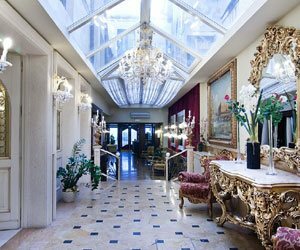 Welcome to the Hotel Belle Epoque, one of the friendliest, most elegant and accommodating hotels in Venice. Located in the heart of Venice, a short walk from Santa Lucia train station and in the middle of the bustling Cannaregio district of Venice. The prestigious Hotel Belle Epoque offers comfortable 3 star rooms with excellent customer service close to all the important Venetian landmarks. Check our Special Offers page for regular updates on the promotions we have on offer only here on the official website of the Hotel Belle Epoque. It is situated in Cannaregio, one of the six historic sestieri (districts) of Venice and close to Santa Lucia train station and the Cannaergio area of Venice that embodies Venice’s architectural and decorative styles, the Grand Canal, the Rialto Bridge, and St Mark’s Basilica. 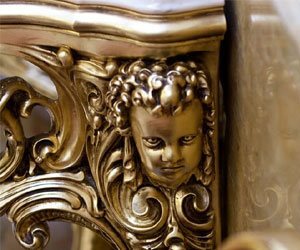 Complementing the grand palaces and illustrious canals that make Venice famous, the Hotel Belle Epoque bathes guests in the radiance of classical Venetian design. Décor is in the style of the Belle Époque (French for Beautiful Era) - a golden age of peace in 19th century Europe. All rooms are modern, clean and comfortable. 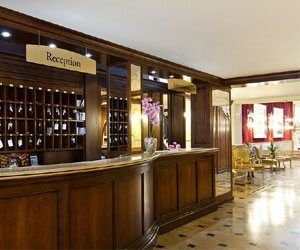 See our Rooms and Services pages for more details of the modern luxuries at guests’ disposal in this fantastic 3 star Venice hotel. The newly developed Hotel Belle Epoque 360 Interactive Virtual Tour may help to give you an insight into the elegant style and warmth of ambience at this exclusive hotel. 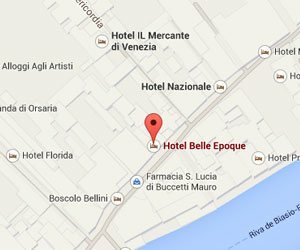 The Hotel Belle Epoque’s location makes it a very popular choice among visitors to Venice. Our staff speaks the following languages: English, German, French, Spanish, Portuguese. 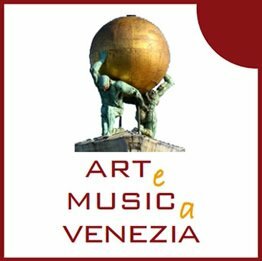 For more details on the hotel’s location in the centre of Venice, check our Interactive Map of Venice on our Location page. To see our Video Tour.